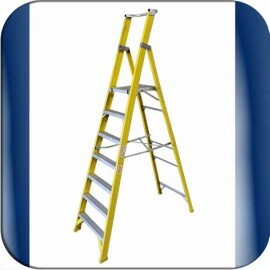 Quality industrial duty ladder with 150Kg rating. Insulation Capacity 10KV. Maximum length when fully extended is 5.35M. Comes with pole attachment. Quality industrial duty ladder 150Kg rating. Maximum length when fully extended is 6.55M. Insulation Capacity 10KV. Quality heavy duty ladder with 150Kg load rating. Ladder height is 0.9M. Great for electricians or ceiling work. Quality heavy duty ladder with 150Kg load rating. Ladder height is 1.2M. Great for electricians or ceiling work. Quality tradesmen’s ladder with 150Kg load rating. A-Frame height is 1.7M. Maximum length when fully extended is 3.3M. Quality tradesmen’s ladder with 150Kg load rating. A-Frame height is 2.0M. Maximum length when fully extended is 3.9M. Quality heavy duty ladder with 150Kg load rating. A-frame height is 2.3M. Maximum length when fully extended is 4.5M. Heavy duty 150Kg load rating. This ladder has load rating of 150Kg. Platform height is 2.1M. Length when fully folded is 3.1M. Heavy duty 150Kg load rating. This ladder has load rating of 150Kg. Platform height is 2.4M. Length when fully folded is 3.4M. Quality heavy duty ladder with 150Kg load rating. Ladder height is 3.5M. Length when fully folded is 3.6M.